Donald Trump’s two years as US president have been marked by a number of high-level resignations with varying degrees of scandal. Former Secretary of State Rex Tillerson learned about losing his job on Twitter, amid reports that Trump had called him “dumb as a rock”. The current US secretary of state made even the audience at the Global Entrepreneurship Summit (GES) in Kansas giggle when answering how it felt working in his role with President Donald Trump, and how long he was going to keep his spot. "I’m going to be there until he tweets me out of office", Pompeo said, adding "[w]hich I’m not counting on, at least today”. The remark apparently hinted at the circumstances of his predecessor Rex Tillerson’s resignation. Trump announced the move on Twitter after a year in office that was marked by a number of tensions between the two, including their respective stances on North Korea. It was later reported that Trump had not even personally informed Tillerson before the decisive tweet. Pompeo’s quip about Trump’s habit to tweet major announcements along with anti-Fake News rants caused a storm on social media. Pompeo: I'm staying until Trump tweets me out of office. It's hard to gauge whether or not Pompeo is cracking a joke, or readying to pack his bags?? Either way, the "stove is warming", and the WH "Heat" is possibly about to get hot as HELL. Not, to mention that, "Twitter/Trump" nightmares are about to start sleepwalking. 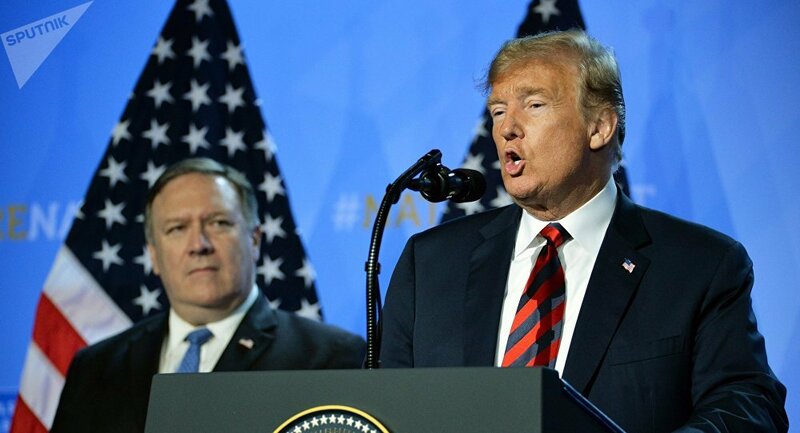 During the public talk, Pompeo also revealed details about working with the current commander-in-chief, saying that Trump is “truly a leader” who provides guidance to him. “He says ‘Mike, this is the direction we want to go. It is oftentimes different than what we have done before’. I think that’s a great thing…He gives me that guidance and then he sets me free and holds me accountable”, Pompeo told the crowd. According to the top diplomat, Trump “demands that the State Department deliver on the things” they said. “I lay out for him couple times a month, he hears these set of objectives: immediate, near term, medium term, long term”, he noted.